+ What is included in a birding day tour in and around Cape Town ? + What weather can we expect in South Africa ? The weather in the Western Cape is mild and Mediterrean in nature with warm dry summers and wet cold winters. The rest of the country has mostly summer rainfall. The north east of the country is sub-tropical with wet summer and mild winters. The Highveld on the plateau gets very cold and dry in winter and thunderstorm rain in summer. The Eastern Cape has wet hot summers and mild dry winters, The Karoo has less rain in summer and icy cold winters. The Kgalagadi also has rain that transforms the vegetation in summer when it is extremely hot, Winter days are mild but overnight temperature drops to minus 10 degrees celcius. + Is it safe to travel in South Africa ? As in all countries there are certain areas that are to be avoided. We take every precaution to avoid areas where problems might arise. To date we have not had a single client experience any form of crime. We will endeavour never to put you at risk on your travels.Also your guide is ex-military and knows how to deal with sitautions. + Does South Africa have malaria ? Most of South Africa is not affected by the Anopholes (malaria carrying) Mosquito. You need only concern yourself with this problem when travelling in the tropics on the north eastern corner. Provided you take the appropriate prophylaxis you should be fine. Summer months is when the mosquito is most likely to be encountered. + Is tap water drinkable in South Africa ? Yes, tap water is mostly drinkable but bottled water is available. Cape Town is particular has a very good quality of tap water. + What clothes should I bring to South Africa ? Come prepared. Summers are warm to hot and winters are mild to icy. Be sure to have comfortable clothes especially walking shoes. If you forget anything I am sure you can pick up what you need along the way. Also be sure to have good head gear. Ask if you require further information. + What gear should I bring ? Bring your scopes, binoculars, cameras, equipment bags, sunglasses, mobile phones etc. + What electricity supply does South Africa have ? South Africa has 220 volt AC current and a number of adapters are available for your convenience. + What medical services are offered ? All clients are required be bring to your guides attention any medical condition you might have. Your guide is trained in first aid and hopsitals and doctors are available along all routes of travel. + What optional extras are available ? When visiting the bigger game reserves morning drives, sunset and night drives, bush walks, bush braais, sundowners in the bush are all available as optional extras. Please ask your guide to arrange as required. + Do you have carry books on birds, mammals etc that we are likely to see ? Yes, we carry all the necessary books and multimedia that might be required. + Are you flexible with your tour itinenary ? We pride ourselves in being exceptionally flexible with our itineraries. Where humanly possible we will endeavour to indulge your requirements. + Is alcohol included in the tour price ? Regrettably alcohol is not included. + Will be get to experience traditional South African meals ? Absolutely. Your guide will go out of his way to prepare you delicious traditional meals when possible. + Tell me about the pace of your tours ? I believe in spending at least two nights in each rest camp in order to be able to give you a taste for each particular region! Many endemic species can be missed by rushing through a particular area, Successful birding is all about patience and enjoyment. + What facilities do national parks offer ? South African national parks generally have great infrastructure. They have comfortable bungalows with airconditining, restaurants, swimming pools, well stocked shops and a mix of tar and gravel roads. Many have good hides, look out points and picnic areas, Some even have internet cafes. + Do you offer custom built tours ? We certainly do. We can build any tour you require. We also offer pay as you go tours. 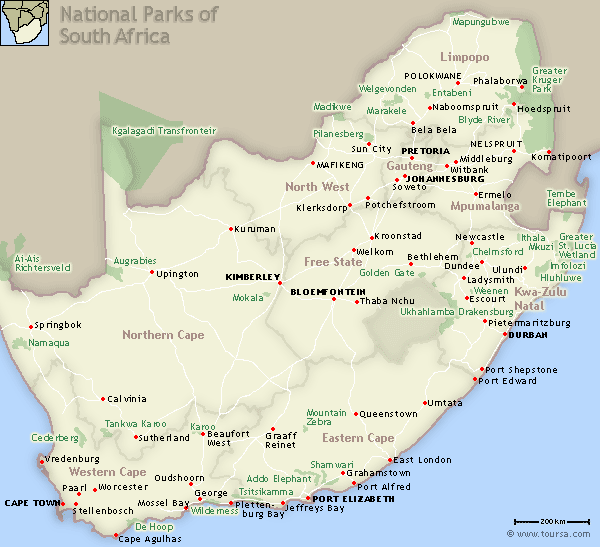 + Where are South Africa's national parks ? + Are single supplements applicable ? Unfortuantely single supplements are applicable on all tours to cover costs.